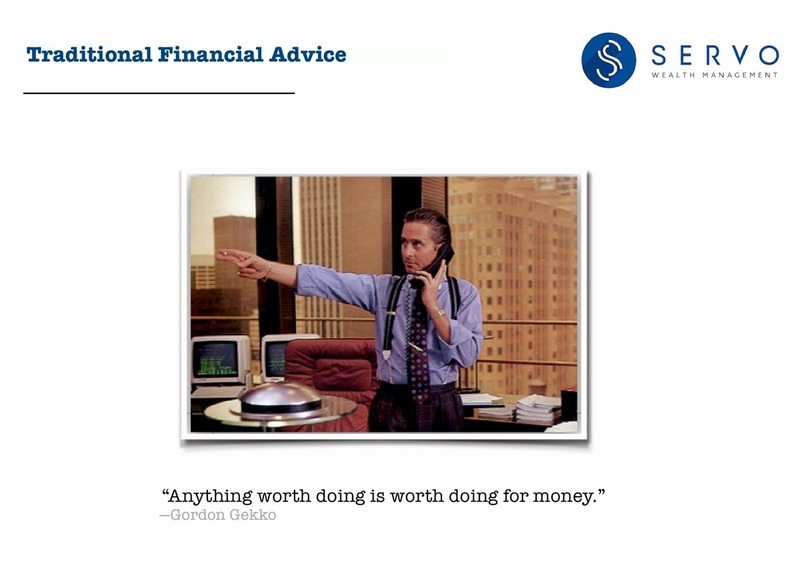 Chances are, when you think about financial advisors, the image of Gordon Gekko comes to mind, the classic character from the movie Wall Street. Gordon's responsible for several memorable lines in the movie, including "greed is good." My favorite, however, is the one listed above. "Anything worth doing is worth doing for money." It reminds me of the mindset many financial advisors still have. They are in the business to make money first and foremost, with concerns for their clients' wellbeing a distant second. Many advisors are still charging their clients' commissions, and even when they charge more appropriate fees on the percentage of the assets that they manage, they continue to accept hidden fees and commissions on 12b-1 fees or sales concessions through their firms. Even when they're charging straightforward "assets under management" (AUM) fees, they are misguiding their clients in terms of the advice they give and how they invest. 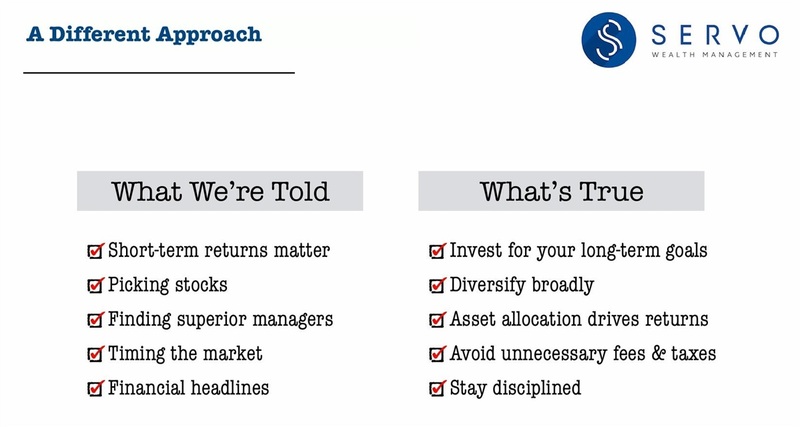 The slide above is one that I often review with prospective clients to show them the stark contrast in philosophy between most financial advisors and the process and beliefs that Servo Wealth Management has. Servo's advice is simple, intuitive, and easier to understand and follow. Besides working with existing clients and helping them to reach their long-term goals, there's nothing I enjoy more than meeting with new individuals and families and helping them to realize there is a better way to achieve their financial dreams. If you know of someone who could benefit from a better perspective or a 2nd opinion on their financial situation, I would be happy to chat with them further through email, a phone call, or a sit-down appointment. And, as always, if you're an existing Servo client, you are always free to touch base with me in between meetings on any matter, no matter how small. I always enjoy hearing from you.